Well today I'm going to talk about some knitting other than our swatches! I've taken a small break (very small about 2 days) to knit something else. My mum bought me some wool this summer that I didn't really know what to do with because I mostly knit with 4ply and it's sort-of scratchy (it's not very scratchy but I'm a big baby and cannot stand anything even slightly tickly) so I couldn't knit anything for me with it. I am a notoriously selfish knitter, I don't think I've ever given a knitted object to anyone other than my bf, where honestly it's just an excuse to knit something for me because I pretty much never make clothes other than scarves and I like making home items and we live together. So today was a large tradition break for me, I made clothes other than scarves, I used some scratchy wool and it wasn't for me. For the record the yarn does look very nice but seriously itchy things blegh. 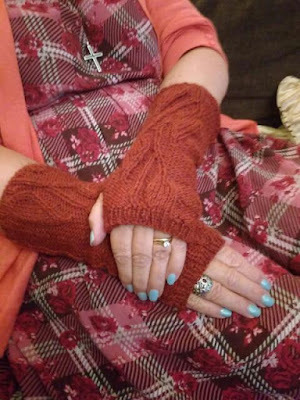 Anyway I got the pattern from that magazine I mentioned last post, so sadly I can't give you the pattern for it because I don't want to be sued, but I will say it's pretty much just armwarmers with a thumb gusset and leaf panel. anyway here's a picture of my mum wearing them. If you want to know the magazine it's literally just called knitting, you'll know that you've got the right one because the front page has a ginger woman wearing a brown leaf dress. Anyway a quickie today because it's a pretty simple pattern I can't really say alot about and I've already been waffling on abit. garter zig-zags on stockinette background it tends to lay flat. 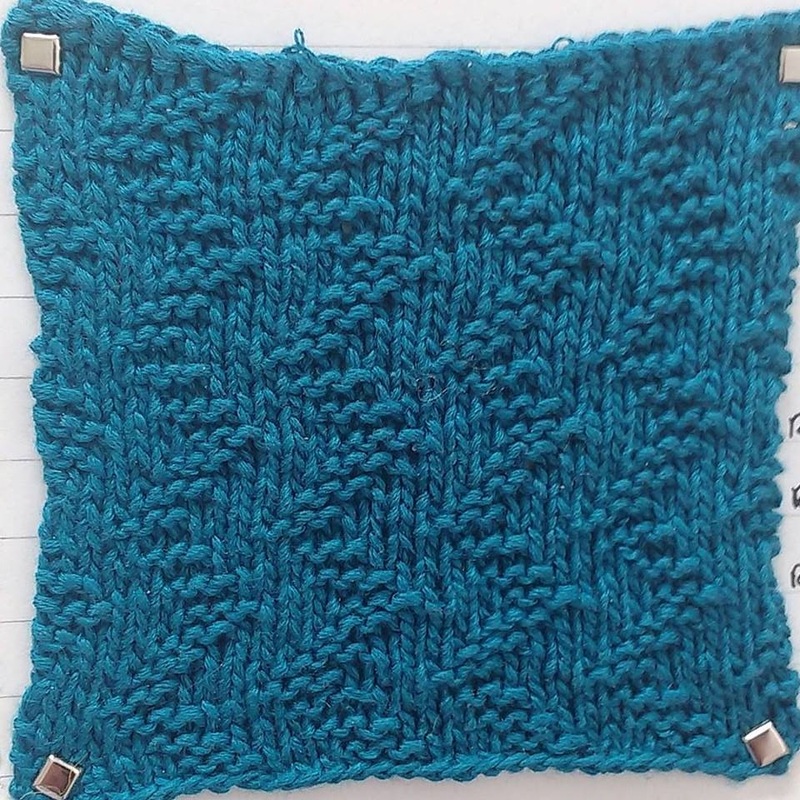 It has a weirdly 3 dimensional look to it up close, but from a distance the pattern isn't very distinct from far away so you could probably make a weird optical illusion if you made a whole item out of this stitch. Well that's the pattern today, I would link to the magazine subscription but the link is super long and it's easy enough to find by reverse image searching the top image. 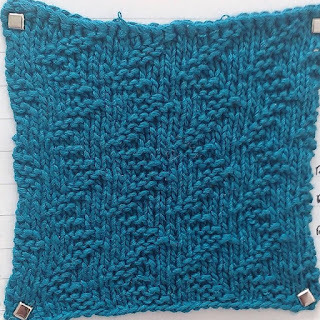 I might do some more patterns in the magazine or even some free online patterns that I can directly reference but for now on with the swatches and Happy Knitting!